The Aero autoloader series duplicator is the latest line of market leading standalone robotic loading duplicators. The trademark TITAN series of standalone autoloaders from Vinpower Digital has been a huge success in the market due to the TITANâ€™s reliability and efficiency. In fact it became a benchmark for other standalone autoloaders to compare themselves to. Yet if there was one knock on the systems, it was the perceived lack of speed for the robotics. Even though, like with most moving objects, such as cars, speed kills. Fast moving parts often cause errors, stopping the autoloader before the job is done. Even though slow and steady often wins the race, we listened to the requests from our loyal customers and set out to make a reliable autoloader that still offers a sizeable capacity with 2, 4 or 6 burning drives with a robotic arm that is considerably faster than the TITAN series, but still retains the reliability and convenience. Thus the Aero series was born. The Aero series, available with 2 drives and 220 disc capacity plus 4 or 6 drive configurations with 660 disc capacity. The Aero is the perfect blend of old traditional values and new supped up technology. Plus with a price point below most other similar loaders on the market, The Aero series makes the most sense financially as well as performance wise. The Aero series autoloaders are the top choice for any company or individual that needs to duplicate medium to large jobs in the shortest period of time! 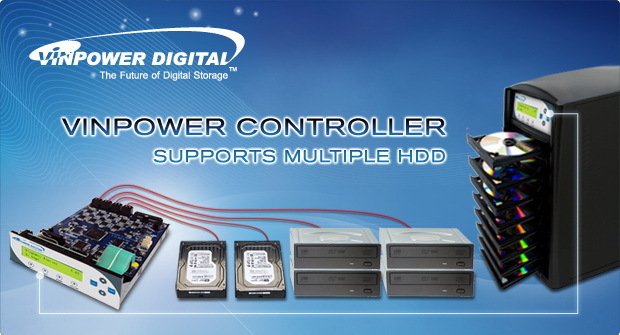 Vinpower’s controllers can support multiple HDD’s within a single duplicator for greater storage capacity. There have been numerous occasions we’ve heard from customers that they wish they could get more hard drive capacity, but it’s either too costly or there isnâ€™t a single HDD big enough to match their storage requirements. The cost savings are significant, as in many cases, it’s cheaper to purchase 2 smaller capacity HDD’s compared to 1 very large HDD. Take for instance, at today’s rates, itâ€™s cheaper to purchase two 1.5 TB HDD than to purchase one 3 TB HDD. Allowing a user to capture the best price point, while maximizing the storage capacity, is a real best buy! The second factor is simply not having enough storage capacity. This is especially true for Hi-Def content, even when using a 2 TB HDD. Whether the user is a production house, or an amateur videographer, itâ€™s not unusual for content to overload a single HDD. That is why Vinpower has programmed its controllers to accept multiple HDDâ€™s in a single duplicator, to allow the user greater flexibility in controlling costs and overall storage capacity. So if you’re tired of being limited by other less user-friendly duplicators, contact Vinpower to learn more about and other market leading features. Don’t get left behind, speed up with a USB 3.0 connection on your Blu-ray duplicator. Vinpower Duplicators have long been using the USB connector to allow the user to transfer content from a computer to either a single drive or directly to the duplicatorâ€™s hard drive (HDD).This method is often the easiest or only method by which the user can create the master disc or upload the master content onto the duplicatorâ€™s HDD.When it comes to CD or DVD, the transfer rate of the USB 2.0 (rated at 60MBytes/sec) was adequate. Now, we are living in the world of Blu-ray and disc capacity is growing by leaps and bounds. The older USB 2.0 transfer rate is just not going to cut it when you need to burn or transfer anywhere from 25GBâ€™s to over 100GBâ€™s of data. At that rate it could take hours to make a single Blu-ray master disc. The Vinpower USB 3.0 connection is compatible with all of Vinpowerâ€™s advanced USB connected features such as PC Connection, Drag & Drop, Copy Protection and others. 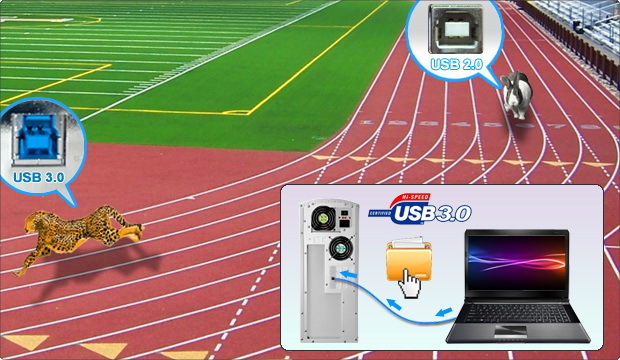 The USB 3.0 PC connection also supports ISO, NRG and multi-file drag and drop for all formats at a much faster speed than USB 2.0. With the introduction and the implementation by Vinpower of USB 3.0, (transfer rate up to 5Gbit/s and backwards compatible with USB 2.0), available on all manual tower and specific autoloader duplicators, the transfer time will be knocked down to minutes or even seconds.This will enable those looking to duplicate content onto Blu-ray discs, the ability to transfer that data through the USB 3.0 onto a master disc or the duplicatorâ€™s HDD rapidly and eliminate wasted time getting started. Contact Vinpower today to learn more about the USB 3.0 connection offering. Vinpower’s TITAN Supreme Autoloader series offers time saving Auto features for the copy, compare, and copy plus compare features. The primary benefit of an Optical Disc (CD, DVD, BD) autoloader is the convenience and lack of effort and manpower needed to operate the device. The ability to copy thousands of discs robotically, with minimal human interaction, is a tremendous plus to those with heavier duplication requirements. Yet, most autoloaders require the user to spend a lengthy amount of time preparing and programing the master content to be copied and/or compared to the original master before they can actually begin the duplication process. That is why Vinpower created the beneficial Auto-Copy, Auto Compare, and Auto-Copy and Compare features. Each of these features allow the user to merely place the master content on top of the stacked media on the 1st input spindle and push a single operation button and the loader will handle the rest. It couldnâ€™t be easier! 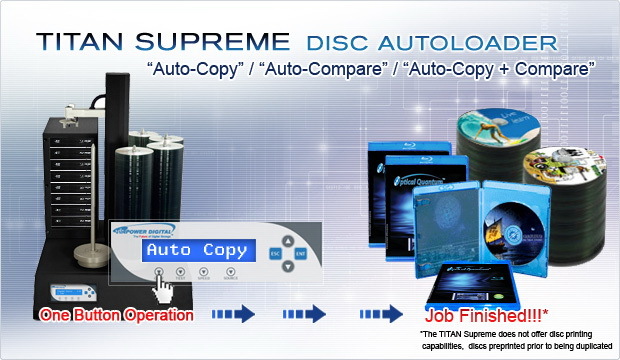 The TITAN Supreme is not only the most productive standalone disc autoloader on the market, itâ€™s probably the easiest to use as well. Contact Vinpower today for more information.